Know What to Pay for them and how much to put into them for maximum profits. What This Offering Will Do For You - Locate, analyze & evaluate potential flip houses and quickly estimate profits before you buy the house. Also, how to structure the deal to leave the seller in and reduce your acquisition costs and how to keep track of all the expenses. 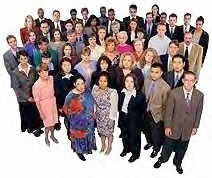 All forms, software are included. This can be run from you home. 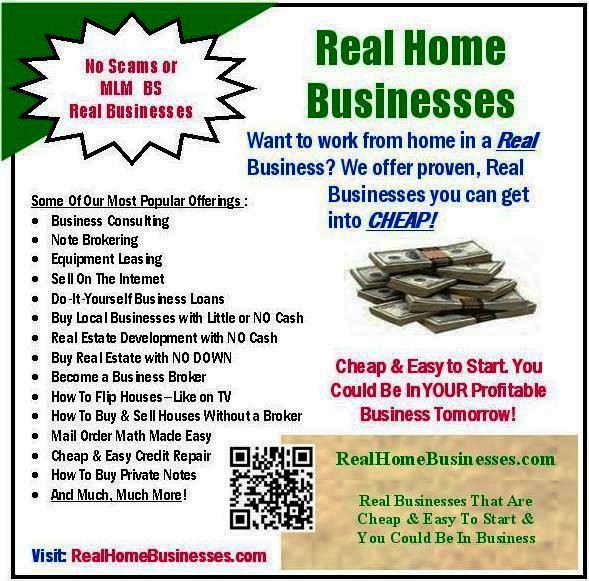 We got into flipping houses as an outgrowth to our buying houses with no cash down payment. As with our NO Down Real Estate program, I wanted a quick and easy way of estimating all costs to quickly arrive at a profit figure. I wrote this system in Excel and here is how I put it together. I went to Lowes Home Improvement Store and wrote down the prices of all the items I might need to rehab a house and also, where provided, the installation costs to put these items in place. You can use any reputable home improvement store to get this information for your local market. I put all this data into the spreadsheet. Now when I look at a perspective rehab house I first take pictures of the house from all sides and take close up pictures of any real bad item or area found. Then I draw the house foot print and measure my way around the whole house. Now I have a crude sketch of the house foot print and have their measurements, later I put this down on graph paper (optional not required) and make a brief scale drawing of the house. Then I mark all the appropriate items on the exterior of the house on my checklist. Then I go into the house and sketch each room onto my floor plan. Then I measure the interior room including the ceiling height. I also take pictures of all areas of each room. Then I note on my checklist what items in each room need to be replaced. All told, it takes me about a half an hour to inspect a house, take the pictures and measurements and make notes on my checklist. When I get back to my office, I enter all the house dimensions into the spreadsheet. The spreadsheet tells me room by room how much it will cost to carpet or put vinyl floor covering down or paint or whatever. If the room needs that item, I copy the amount to do the work onto the live column. Once I have entered all the data from the outside of the house and room by room on the inside, the program will tell me how much it will cost to cure the problems. All this takes about 15 minutes. My goal is to bring the house up to the average price for the neighborhood. I plan on buying (or Controlling) the house at the low end of the scale and rehabbing it , sell it at the average neighborhood value and profit. You don't have to own the house to make this work, you just have to control it. A typical deal would go as follows. A distressed house is located in a neighborhood that is selling for about $100,000. I inspect the house and estimate the repairs needed to bring it up to market standards would be about $25,000. I offer to pay the seller $50,000 for the property and put $25,000 into the property and sell it for $100,000 and make a profit of $25,000 in the span of about 4 months (rehab time + real estate marketing time). Sometimes the profit is greater than this and sometimes the profit is a little less but there is always profit there. I plan on doubling or tripling my money in about 4 months! On TV they turn these properties over in 2 weeks but we feel this is unrealistic and causes undue stress and ill-feelings with your contractors. Your contractors will make you money over and over again; keep them happy! Once I know the cost of the rehab work I make an offer to the seller. If the offer is accepted, I have my team of contractors inspect the house and give me bids to do the work needed. If this is in line with my estimates I close the deal and get my contractors to work. I typically allow 30 to 45 days to rehab the house and 3 months for a real estate agent to sell the house, for a total of 4 to 4.5 months. Now if you double your money in 4.5 months, that is equal to a 267% return on your money. This example shows doubling your money but there are deals where you triple your money.... that's over 500% APR on your money! Double or Triple your money in a few months! Our system will include creative ways of financing the acquisition and the rehab work to minimize the out of pocket expense to you. This system could put $25,000 or more into your bank account in the next few months. You do this a few times a year and you've got a great business going. 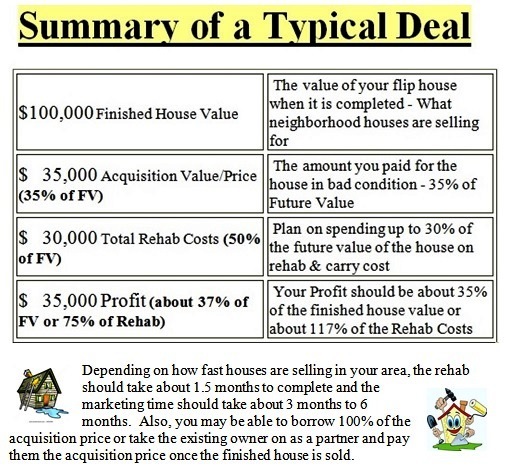 Depending on how fast houses are selling in your area, the rehab should take about 1.5 months to complete and the marketing time should take about 3 months to 6 months. Also, you may be able to borrow 100% of the acquisition price or take the existing owner on as a partner and pay them the acquisition price once the finished house is sold. Click Here to download the above graphic. You should be able to buy junk houses all day for very little cost. I suggest you buy them, using our NO Down program and then use that house to borrow your rehab money. You should be able to structure your deal to make a profit of about 35% of the finished house value and do this with a crew of handymen in less than two months. 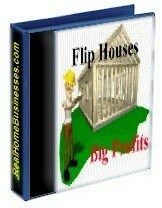 In Short: Everything you need to find, buy, rehab and sell your first flip house.